Chlorophilia is a new project by Ross Lovegrove, who highlights once again the skill of Artemide in the light engine of the lighting body through his signature approach to organic and fluid forms. 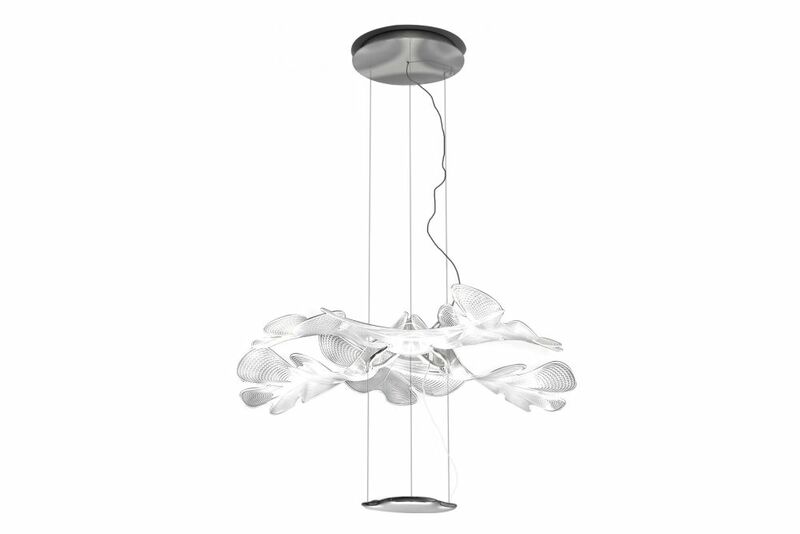 It is a highly scenic, yet light suspension appliance that, when switched on, unveils a contrast of delicate shades interacting with space and completing it.Its body contains a LED COB that works as a heatsink, as well as light phytomorphic elements made of moulded pmma, which combine the gently wavy texture with an uneven stepped section that works as an optical lens.The suspended central body emits indirect light, which is filtered and refracted by three clear surfaces, whose natural shape recalls natural elements, leaves. These three elements are arranged in a sunburst display and partly overlapped to multiply the shadow contrast, thus generating a scenic effect on the ceiling, however combined with appropriate ambient lighting. Chlorophilia defines an optical and building principle, which can be reproduced by multiplying its elements to create compositions that develop on multiple levels in space or whose width is expanded.